TESCO BORDEAUX SUPERIEUR 2017. Red Wine, product of France. A classic red wine with flavours of blackberries and plums and a savoury finish. Store in a cool, dark place. An intense and complex red wine with flavours of plums, blackcurrants and spice coming from oak. This wine comes from one of the best known wine regions in France - Bordeaux. 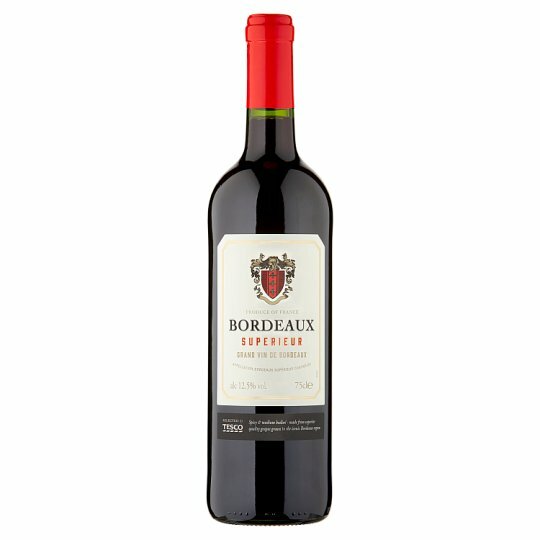 This Bordeaux Superior comes from the Appellation or area of Entre de Mers and surroundings areas, which is situated south of Bordeaux, Some would call this area the engine room of Bordeaux where classic, approachable red wines are made.